LOS ANGELES, California, November 19, 2017 (ENS) – Moving bus stops away from intersections would reduce the amount of pollution to which bus riders are exposed, scientists from the University of California Los Angeles report. 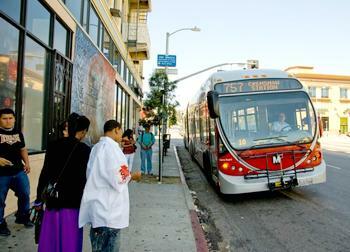 In many cities, both in the United States and internationally, bus riders can spend 15 to 25 minutes or more each way waiting for their bus. “The wait often means spending time in some of the most polluted locations in cities, close to intersections where cars, trucks and buses are continually stopping and accelerating, spewing out high concentrations of noxious exhaust,” said senior author Suzanne Paulson, UCLA professor of atmospheric sciences. “The exhaust contains gases and large amounts of ultrafine particles that are essentially unregulated by the Environmental Protection Agency because the EPA regulates fine particles by weight, and these particles weigh so little,” Paulson said. “Our measurements show that traffic-related pollutant concentrations peak near intersections and decrease sharply with distance,” she said. Bus riders’ exposure to the pollutants would be much reduced by moving bus and light rail stops 120 feet away from busy intersections, her research team reports. The study was led by Wonsik Choi, a postdoctoral researcher in Paulson’s laboratory, and funded by the National Science Foundation and the California Air Resources Board. The researchers used a zero-emission vehicle equipped with specialized instruments to measure ultrafine particles and other tailpipe pollutants, such as nitrogen oxide and carbon monoxide. They made measurements in several neighborhoods in Los Angeles and surrounding areas, including downtown Los Angeles, Beverly Hills and the San Gabriel Valley. The research was conducted on 15 days from summer to late fall in 2013 and over four days in the summer of 2014. The researchers drove back and forth across 10 intersections with traffic signals and nearby street blocks during mornings and afternoons, 1,744 times, taking measurements every second. “We then combined and analyzed the data for each intersection to create high-resolution maps of pollutant concentrations along the blocks,” said Choi, an assistant professor of environmental atmospheric sciences at South Korea’s Pusan National University. The researchers calculated the quantity of ultrafine particles and other traffic-related pollutants transit users would inhale if the stop was farther from the intersection. “Except in areas with minimal traffic, we always found there would be a significant reduction,” said Paulson, who is also a member of UCLA’s Institute of the Environment and Sustainability. She noted that trash trucks and other large vehicles spew much more toxic fumes near intersections, when they are starting and stopping. The UCLA researchers found that roadway pollutant concentrations generally peak within ±30 meters from intersections. Pollutant concentrations decrease sharply with distance. They found that placing bus stops 40–50 meters from intersections significantly reduces exposure to ultrafine particles. Traffic engineers believe that traffic flows better if bus stops are located after intersections. Better traffic flow can mean less stop-and-go, which can also improve air quality. In urban areas, the researchers said, moving the stops farther away reduces the amount of pollution transit users breathe, as long as the stop is not so far that it gets pollution from the next street.